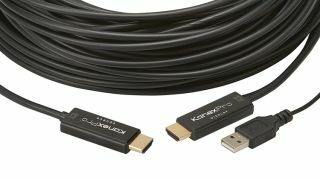 The What: KanexPro has launched the Active Optical Cable (AOC), an HDMI 2.0 cable with ethernet designed to deliver UltraHD up to 18Gbps. The What Else: The AOC delivers uncompressed 4K resolutions with 32 audio channels for multi-dimensional immersive audio with up to 1536kHz sample frequency for high-quality audio. Available in lengths of 30 meters, 50 meters, or 100 meters, the AOC has an integrated USB connector to draw power from the display and dynamic synchronization of video and audio streams. Supporting sub-sampling rates of 4:4:4, 4:2:2, and 4:2:0 YUC with deep color and HDR, the AOC is resistant to EMI and RF interference to provide users with noise-free video and audio. The AOC is HDCP compliant and supports wide-angle theatrical 21:9 video aspect ratio, 3D, and 4Kx2K. “Our Active Optical Cables provide integrators with a reliable, robust solution for transmitting high-quality audio and video,” said Kashyap Khetia, product marketing manager for KanexPro. The Bottom Line: The AOC accepts the same electrical inputs as traditional copper cables and instead utilizes optical fiber between the connectors to extend HDMI signals with zero loss or latency.